“So pleased with the plantation shutters that I ordered from you. They look amazing and the service I received from start to finish was excellent – many thanks. I will definitely recommend your services”. “I was first introduced to Redmond Design & Build by a neighbour who was having extensive work done. Throughout that time, I was able to see the quality of the work and therefore, was very happy to accept their estimate for work in our home. Redmond Design & Build has fitted 2 sets of fitted wardrobes, a complete bathroom, shower room, along with the odd cupboard doors and all sorts of extra jobs. Ciaran, and his team co-ordinate very well with various contractors, so things run very smoothly. As a client, I was extremely pleased with the high methodical and meticulous. They stay within budget, they are careful with their surroundings and clean up. I would highly recommend them”. New single storey extension, new kitchen, slab tiled patio and garden re-fenced. “We have been really pleased by not only the quality of the work but also the service throughout. Great communication, clear and always helpful. Would highly recommend”. 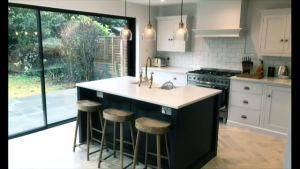 Redmond Design & Build is a family run business with a vast range of experience in the building industry – offering a friendly and efficient service. © 2017 Redmond Carpentry . All Rights Reserved.